Are you still lamenting the passing of the convertible Chrysler 200, the affordable, sun-soaked cruiser and possibly the unofficial rental car of Florida? If so, put down the tissues and visit your local Buick showroom. There you'll find the 2019 Buick Cascada, a two-door soft-top that adheres to the 200-esque philosophy of being a relaxed Sunday beachgoer that won't break the bank. The Cascada remains largely unchanged for 2019, though prices are now cheaper across the board. All versions of the 2019 Buick Cascada are powered by the same 1.6-liter turbocharged inline-four making 200 horsepower and 207 pound-feet of torque. Moving this power to the front wheels is a six-speed automatic transmission. Together, this combo nets the Cascada an EPA-estimated fuel economy rating of 21 miles per gallon city and 29 mpg highway. While 21 mpg around town seems dismal for such a small engine, remember that this Buick is a porky thing whose curb weight is a few donuts shy of two tons. When you're asking 1.6 liters to move 4,000 pounds with any authority, expect to be milking that turbo for all it's worth – a move which inevitably drags down gas mileage. A better number to think about is 17 seconds, which is the time it takes for the power-operated soft-top to open or close. It's a feat that can be performed on the fly at up to 31 miles per hour, a boon in those instances where a storm suddenly interrupts your afternoon cruise. The cloth top is offered in three colors: black, dark red, and mocha. Back in the day, it was the trademark Dynaride suspension tuning that made a Buick a Buick. Today, that old floaty suspension setup is long gone; in its stead is QuietTuning. While it might not roll off the tongue with the marketing dazzle of Dynaride, there's no doubt that QuietTuning will be appreciated by modern crop of Tri-Shield buyers. It includes exclusive sound-deadening treatments such as an acoustic-laminated windshield as well as special engine and suspension tuning to quell any potential noise, vibration, and harshness. Like prior years, the Cascada comes in three distinct trim levels. Being a Buick, even the $33,995 (all prices include the $925 destination charge) base Cascada comes equipped with an ample amount of standard features. As such, every example leaves the factory with niceties such as heated seats, a heated steering wheel, HID headlights and LED taillights, a seven-inch touchscreen with navigation, eight-way power leather seats, and dual-zone climate control. 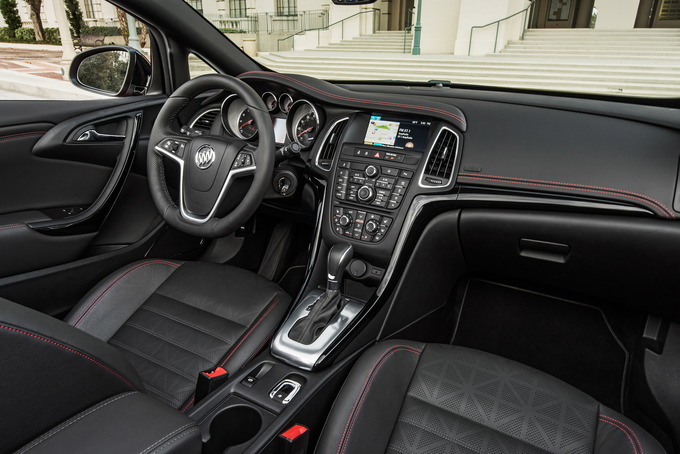 There's also 20-inch wheels, a 17-inch spare (something that's becoming a rarity these days), split-folding rear seats, remote start, keyless entry, 4G LTE with WiFi, and Buick Connected Access cloud services. Only two colors are available for the base model – a no-charge white and a $395 blue metallic paint. Both can only be paired with a black top. Besides that azure hue, there are no options or packages available for the base Cascada 1SV. Slotting in above the base model is the $36,995 Premium. On top of what's included with the base trim, the Premium adds automatic headlights, rain-sensing wipers, air deflectors front and rear, front and rear park-assist, forward collision warning, lane departure warning, and distinctly-patterned 20-inch wheels. The Premium also allows buyers to pick from three available soft-top colors, two interior hues, and six exterior paint choices. As with the base trim, all paint colors but white are an additional $395. The two optional soft-tops are no charge but can only be paired with certain exterior colors. The only available options for the Premium are all-weather floor mats for $140 and alloy-trimmed sport pedals for $165. The $37,995 Sport Touring sits atop the Cascada family tree. Exterior hues are cut down to just three no-cost choices, though all three shades of top and the two interior colors remain on the table. Standard features beyond that of the Premium include unique wheels, sport pedals, and a flat-bottom sport steering wheel. The sole option is the Dark Effects Package ($125), which includes gloss black mirror caps and grille, body-color fog light accents, piano black trim, and contrasting red stitching on the seats, dash, and door panels. If white or blue are your colors of choice, we'd recommend sticking with the base 2019 Buick Cascada. For the price, it's very well equipped, and the comprehensive list of standard features means that buyers will be wanting for very little. If that limited color palate is too constraining, though, the Premium's expanded list and extra helping of safety features make it a good choice as well. Convertibles are few in number and the Buick Cascada is available only as a drop-top model. The 2019 Buick Cascada offers a good-looking exterior and a long list of standard features, but it's heavy and suffers in the fuel efficiency department. 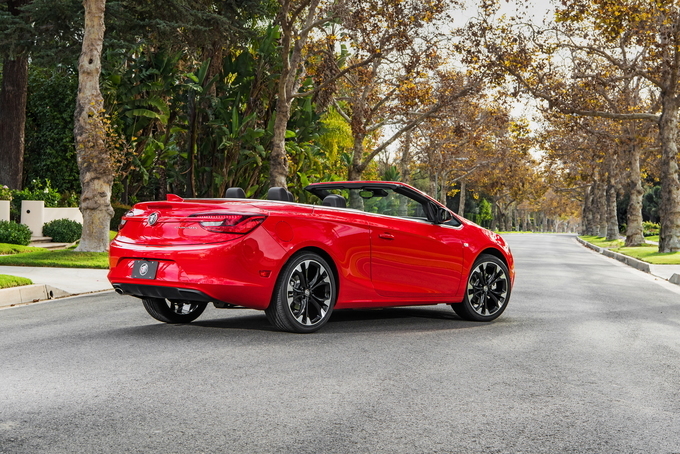 The 2019 Buick Cascada is a compact two-door convertible. This model seats four and comes with front-wheel drive. 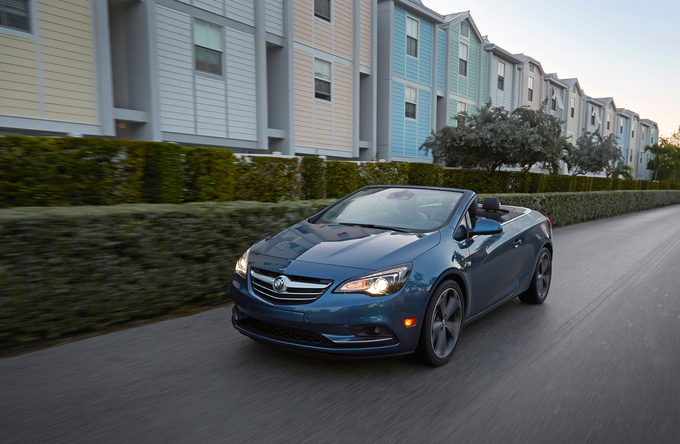 Buick offers the 201 Cascada in three trims: base Cascada 1SV, Premium, and Sport Tuning. All models come with a turbocharged four-cylinder engine and a six-speed automatic transmission. This model is built in Poland by Opel, which used to be owned by General Motors, but is now under the control of the PSA Group. You have one powertrain choice with the 2019 Buick Cascada: a 1.6-liter turbocharged four-cylinder engine with 200 horsepower and 221 pound-feet of torque. The six-speed automatic transmission tends to slur a gear or two and has two fewer cogs than what we’d like. Although the performance output is decent, this is a heavy car, weighing nearly 4,000 pounds. Thus, the engine has to work hard to keep up. In doing so, its fuel economy suffers, coming in at just 21 miles per gallon city, 29 mpg highway, and 24 combined. Blame the body style, as more steel was needed to ensure body stability. The 20-inch wheels don’t help matters, either. We find the Cascada’s steering to be accurate and weighted well, but it isn’t especially communicative. You’ll feel some turbulence through the wheels as well as ample body lean as you corner. The braking is firm, but there's no available automatic emergency braking. The Cascada’s appeal is chiefly with its exterior. The sheet metal is clean and elegant, offering a conservative design. Touches of chrome embellish the body with a blacked-out grille dressing the Sport Touring model. Some may find the look too conservative, perhaps disappointed that the character lines aren't as fluidic or the sculpting deep. Choosing one of the three available roof colors puts your own styling statement on this convertible. Inside, the cabin isn't as appealing as the outside. We take exception to the preponderance of buttons in the center stack. It's a look that was more commonplace five years ago then it is today, and something we wish Buick left behind. On the other hand, all models are dressed in leather and feature beautiful perforations. This is the one bright spot in an otherwise unexceptional cabin. 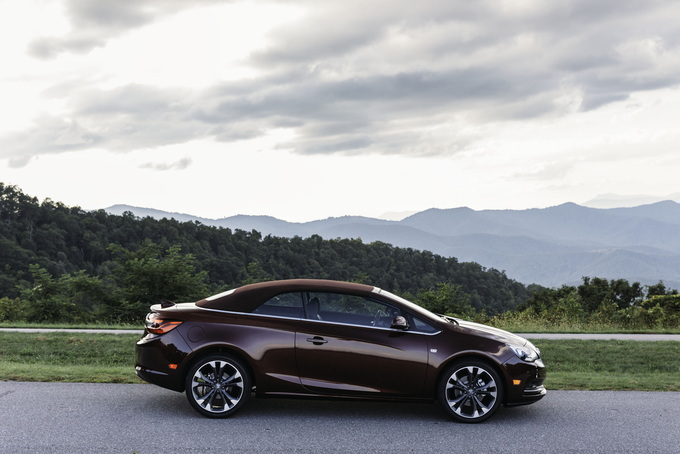 The best thing about the Cascada is that it supplies a welcome open-top driving experience. The second-best thing is the cabin is quiet with the roof in place. We’re disappointed that automatic emergency braking hasn’t found its way to the 2019 Cascada, not even as an option. You'll find automatic emergency braking on far less costly models, including as standard on several Toyota models. The person who prizes a top-down driving experience will naturally be drawn to this Buick. Its good looks attract, although you have to overlook a few of its faults to sign on the dotted line. 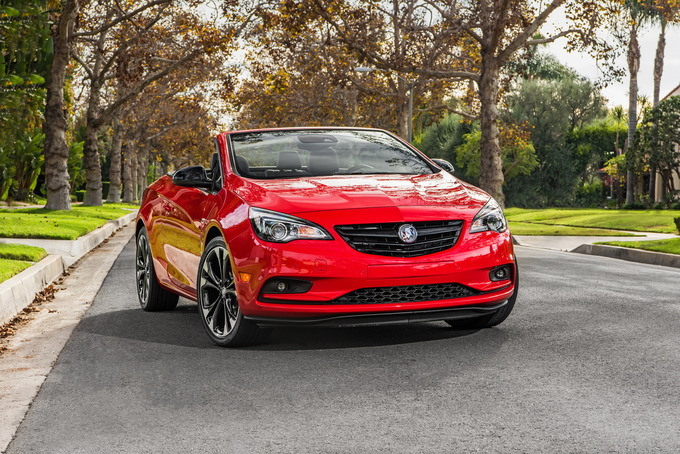 For convertible shoppers desiring a spirited drive, the Buick Cascada is simply the wrong choice. It may be a European model, but it doesn’t keep up with the likes of the BMW 4-Series Convertible. Buick straddles the mainstream and luxury line with its family of premium models. The 2019 Buick Cascada fits in, although its relatively sedate powertrain and uninspiring interior are hard to ignore. That it comes well equipped is something we think will appeal to the right kind of shopper.